I have no particular affinity towards the Ratchet & Clank series. I've played just about every mascot platformer under the sun, but I was always more of a Jak and Daxter man, among a litany of other classics. Not to mention that over the years, the franchise kind of waxed and waned, delivering titles that ranged from forgettable to memorable. I won't forget the new Ratchet & Clank. Ratchet & Clank has been confusingly referred to as a re-imagining of the first game, but I think that's underselling it a bit. There are quite a few alterations to ensure that this is more of an entirely new affair and less of a remake, despite retreading familiar territory. Characters from future games are introduced immediately, for example (like Dr. Nefarious, who didn't appear until the third release). New planets have been added, and existing locations have been completely overhauled with new areas and concepts, like the jet pack from Into the Nexus. It's a full-on reboot with an all-star collective of features from just about every entry in the series. Just like Into the Nexus, Ratchet has a set of wonderful animation sequences akin to a Dreamworks film. Retouching on the origin story helps new players tremendously, because after 12 full entries and multiple subseries, things can get a little convoluted. It's also done in such a way that doesn't feel like retreading for those of you who have already played it to death in the past. But the main reason Ratchet & Clank feels so welcoming from the start is its endearing cast. You can't help but root for these characters, especially the core duo, who are presented as "defects" (one is literal), without making them seem too pitiful. The tone is stalwart and hopeful throughout, and even some of the more nefarious enemies have personality and quirks. I'm not huge on the narration technique, though. The action is actually presented in media res, framed by inmate Captain Qwark, who is telling another prisoner about the legend of the titular team. I wouldn't call him "unreliable," mind, it's just that most of his jokes aren't particularly new territory, and don't match up with the scripted cutscene humor. Having a narrator explain why boxes have ammo in them is something we've seen a million times before, and done better in other games. That doesn't meant the pacing is off, as Ratchet & Clank hits the ground running. The former of the group, a feline-esque Lombax, dreams of becoming a galactic ranger, and after the short aforementioned framing device, players have access to a sandbox in minutes. From there you'll be jumping around the galaxy searching out new objectives, weapons, gadgets, and naturally, other sandboxes to play in. As always, the series uses a mix of melee and ranged action mechanics, on top of gadgets, like jetpacks and holograms. 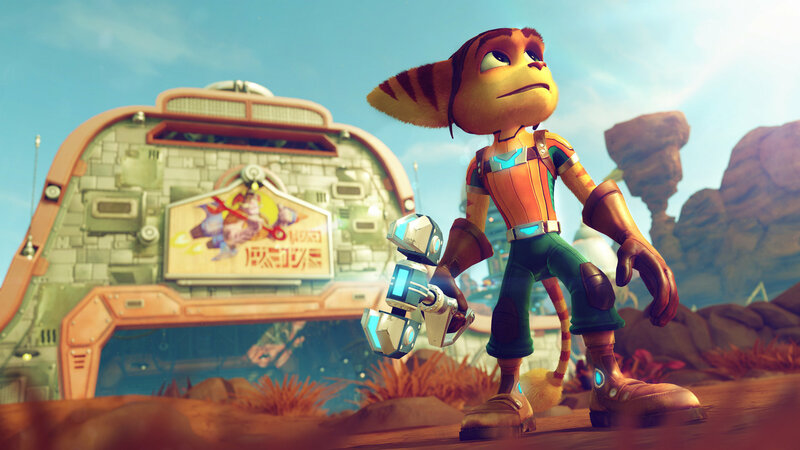 Clank is playable on occasion, with his sequences tinting towards puzzle solving, whereas Ratchet is mostly an "ask questions later" kind of guy, blowing up everything in sight. And it really is easy to blow stuff up. Rachet's rolling strafe dodge is slick, and his arsenal is comprised of over 15 weapons, including my personal favorite Mr. Zurkon, the homicidal companion robot, grenade launchers, guns that turn enemies into pixelated versions of themselves, and so on. 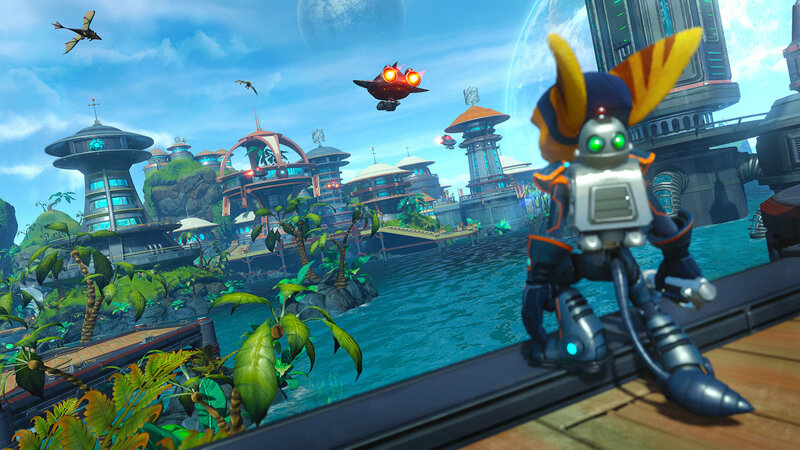 Ratchet & Clank also manages to mix things up to an extent throughout, albeit with things you've seen before. There are some really cool cinematic moments like foot chases, dogfights in space, hoverboard races, and the like. In other words, don't expect Rachet & Clank to reinvent the wheel, but expect to have fun playing it. A currency and XP system cleverly encourage players to actually get involved and earn rewards constantly -- yep, it's one of those silly "blow up crates for cash" games, and I love it for it. The adventure should last roughly 10 hours or so from start to finish, with slightly more time if players opt to go for a 100% rating. Optional tokens also dot the landscape, unlocking new features like screen filters, skins, and cheat codes -- just like the olden days, no DLC purchase required. There's also a New Game+ in the form of a "Challenge Mode" that's unlocked after completing the story, although it unfortunately overwrites the only save data available from the first playthrough. While you will get all of your weapons, you'll start over from scratch in the campaign and earn back your gadgets.